The Razer Turret is a fantastic keyboard and mouse combo, and will be perfect for any Xbox One users looking to take advantage of the new compatibility options. However, its exorbitant price could make it a tough sell for the budget-conscious. For the longest time, game consoles simply didn’t have access to the broad range of peripherals that PC gamers could enjoy. And, while an Xbox One X player still can’t use some of the more bizarre PC gaming peripherals, Microsoft now supports keyboard and mouse compatibility on the Xbox family of devices. And, that’s where peripherals like the Razer Turret fit in. 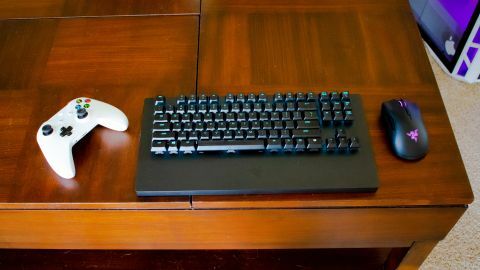 With its prominent Xbox branding, the Razer Turret - a keyboard and mouse combo by one of PC's most preeminent peripheral makers - is primarily marketed towards Xbox One players, though it's compatible with Windows 10, too. On Xbox you'll be able to use it for games like Fortnite, Warframe and Minecraft but - as of right now - the list doesn't extend far beyond that. So is it worth paying $249 (£249, AU$429) for an under-supported keyboard for Xbox One? Yes and no. Right when you take the Razer Turret out of its packaging, the first thing you’ll notice is just how heavy the Razer Turret is: just the keyboard, with the pull-out mouse pad included, weighs a whopping 4.1 lb. This is thanks to the all-metal build. That said, the Razer Turret is one sturdy peripheral, and you don’t need to worry about snapping it after one frantic gaming session. There’s an extraordinary amount of space located under the spacebar. We looked at it in confusion at first, but after using it for a while on our couch, this space is a blessing. You’re going to need a wrist rest if you plan on doing some marathon gaming, and this space provides just that. Then, if you turn over the Keyboard, it’s covered in this waxy non-slip material. This does the job, but man it gets dirty fast. Doubly so if you have cats like we do. The Razer Turret is relatively easy to clean with a wet cloth, just be ready to regularly wipe it down. Back on the top of the keyboard, the keys are elevated above the body, instead of having the deck of the keyboard recessed into the body. This gives it a premium look and feel that reminded us of the Roccat Vulcan 120 Aimo. This raised design also makes it so much easier to clean. You don’t have to worry about hair, skin and food crumbs falling into the void between the keys. This is a Razer product, so of course the Turret is bedecked with RGB lighting. However, Xbox One users won’t have access to Razer Synapse, so the customization is a bit limited. Through the Razer Turret app on the Xbox store, you can change the colors and effects of the RGB lighting, but you can’t create your own custom layouts like you can on PC. On the right hand side of the keyboard, you’ll find a mousepad that you can pull out, and it’s magnetic. This is both a blessing and a curse: in a long game of Civilization 5 it means you can leave your mouse alone while going for a drink of wine in between turns, but in a frantic Fortnite match on Xbox, being magnetically attached to the mouse pad messed us up more than once. The mouse itself is remarkably similar to the Razer DeathAdder Elite. Same amount of buttons, same layout – even the specs are remarkably similar down to the 16,000 DPI. The only difference we can eke out without the DeathAdder Elite in front of us is that it’s wireless. That’s high praise, indeed, as the DeathAdder Elite is one of our favorite gaming mice. The Razer Turret is a beast, and if you’re a console gamer that’s never played games on a mouse and keyboard, you’re jumping right into the big leagues here. We tested this keyboard out in high-speed online games like Fortnite, slow strategy games like Civilization VI and single player adventures like Metro Exodus. No matter what game we were playing, both the mouse and keyboard prevailed. We mentioned the price tag a little bit earlier, but you are getting what you’re paying for. The Razer Turret exudes quality from every pore. The keyboard has Razer Green switches - which we don't love, but still respect - and the mouse has responsive and durable switches that should see it last years. These key switches require 50g of actuation force, which means they’re tactile and responsive – a win no matter how you look at it. And, while wireless peripherals are usually frowned upon among esports players, we didn’t notice any kind of input lag whatsoever. Still, one thing we need to talk about is how the Razer Turret handles on the Xbox One dashboard. While we think it’s great that Microsoft opened up the Xbox One to keyboard and mouse, the implementation just feels half-baked. We would have loved to see the mouse actually work in the dashboard, so we could just fly to whatever game or app we want to launch, much like on Windows. Instead, we’re only able to scroll through options with the arrow keys on the keyboard, and it is not as accurate as it needs to be. We would love to see the Xbox One UI become closer to the Windows UI (though, still controller-friendly, obviously), but it just isn’t there yet. If you’re looking for a keyboard and mouse for Xbox One, and price just isn’t a factor, then the Razer Turret is absolutely one of the best options out there. But, for anyone on a budget, there are cheaper options out there - like the Corsair K63 Wireless Mechanical Keyboard and Lapboard Combo - that will get the job done, even if they aren’t as convenient. Still, this is an extremely rigid, responsive and punchy keyboard, paired with one of the best wireless mice we’ve used. We wish there was a bit more customization for Xbox users and we wish the non-slip surface wasn’t a hair magnet, but those are ultimately minor complaints. We would advise, however, maybe holding off until more of the best Xbox One games are compatible with mouse and keyboard – buying a $250 peripheral for five games is a hard sell.